In the UK there have been privacy fears raised regarding Google's Street View service. Sometimes, however, the Google camera can pass exactly at the right time. In some cases this may even actually help to solve a crime. Well, at least, it may with the case of the stolen £12,000 caravan. The Soan's family live in Linton, near Swadlincote, Derbyshire, England. On June 5th last year Mrs.Soan returned home to find that the caravan kept on their driveway had gone - it had been stolen. The local police had no luck with solving the crime for over nine months until the Soan's son, 11 year old Reuben, turned detective. 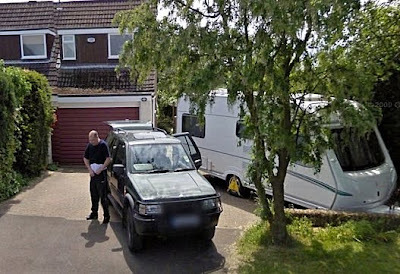 He was playing around with Google Street View and, when looking at the family home, there was the suspect clearly photographed (see above) on their driveway, along with the vehicle that may well have towed away the caravan. The police were notified. The only problem is that Google blank out car number plates on Street View so the driver of the 4x4 is still untraced. This is why Derbyshire police need help in finding the suspect - as pictured. PC Adrian Mason, of Derbyshire Police, said: "It is amazing that we have such a clear image of a man who we think will be able to give us information that would help the police inquiry. It was an amazing coincidence that the Google car was passing at that time. I’ve made extensive enquiries since the image was discovered but because the registration plate of the 4x4 is blanked out we have been unable to trace the man through his car. That is why we are appealing for the public’s help." Police are now checking with Google to see if they have versions of the photo showing the number plate. Quite a coincidence that the Google camera was in Linton at exactly the 'right' time. I find this story more convincing than yesterday's ley lines. This is a coincidence and it would serve the man right if he was found and turned out to be the thief. I don't always agree with some of the stuff you write but it's always interesting. That is some coincidence. Let's hope the police can get this guy, with the help of Google. Fascinating post. There are no coincidences, right? Sorry, meant Rob of course. Don't want to start any rumours!